Rumours of typing "BFF" (Best Friends Forever) on your Facebook to test if your account is secure from hackers or not is actually a hoax. The lie says that if you type "BFF" in a comment on a Facebook post and if it appears green, your account is allegedly protected. If it does not turn green, users are advised to change their passwords immediately as their accounts may be hacked by someone. Many people fell for this after several were seen typing the letters that turned green on a Facebook post as seen in this screenshot via World of Buzz. 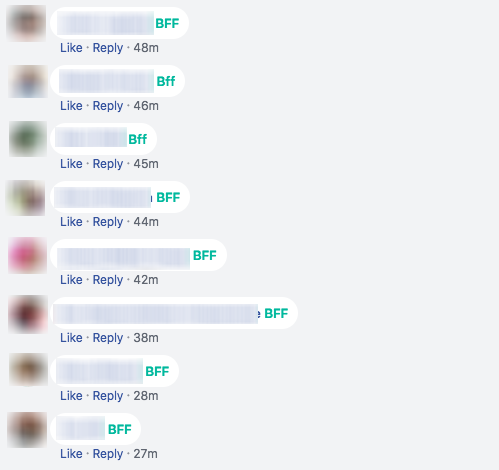 The letters "BFF" turning green is part of a feature on the social media platform where certain words trigger animations, reports Snopes. 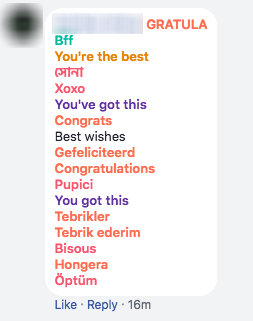 Others among them are "congratulations," and "xoxo". Facebook is currently under fire over the use of its data by British political research company Cambridge Analytica which reportedly obtained the personal information of 50 million Facebook users. Many of us do not realise how we are giving companies a look into our Facebook profiles every time we download a new app or sign into a website using Facebook. If you want to see all the apps that are tracking you on Facebook and know how to block them, check out this Business Insider article. If you have had enough of the social media giant's treatment of personal data, here is how you can move on and delete your account forever.